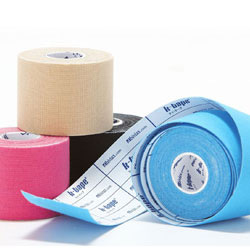 K-Taping can support a wide range of therapies and represents an effective tool for Athletic Therapy CAT(C), Physiotherapy RPT, Massage Therapy RMT and Osteopathy D.O.M.P. Over the last twelve years K-Taping (based on the German K-Taping Academy) has established itself in nearly 40 countries and has become a standard component of many therapies treatment protocols. For more information on this product and the service we offer to administer it, click here.